The New Horizons space probe, which launched on January 19, 2006 from Cape Canaveral, Florida, has been traveling at a rate of 36,373 mph towards Pluto. New Horizons reached its closest approach to Jupiter on February 28, 2007 when it was about 1.4 million miles away. The flyby helped launch the space probe’s speed by 9,000 mph, thereby accelerating the probe to a velocity of 51,000 mph and shortening the journey to Pluto by three years. 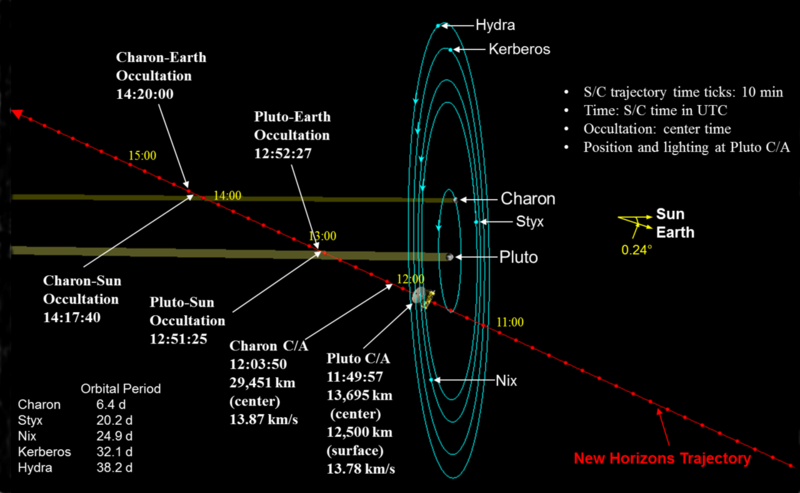 These calculations by Alan Stern, a former NASA Associate Administrator, and his New Horizons team had to be precise with very little margin for error in order to achieve this goal. On July 14, 2015, New Horizons reached the first close-up flyby of this “dwarf planet” in the Kuiper belt, a ring of bodies beyond Neptune. Downgraded to a “dwarf planet” in August 2006 by the International Astronomical Union (IAU), Pluto has attracted much attention recently as New Horizons began sending highly detailed images of its icy mountains back to Earth. This suggests that Pluto is made up of differentiated geological layers; a rocky core that is covered up by a mantle of ice. In addition, the planet is orbited by five moons and a thin atmosphere, unlike a majority of the Kuiper belt objects, which are mostly rocks and ice balls. To get a sense of the scale and distance between Earth and Pluto, the latter is about 2.66 billion miles away from the former. If the Earth is a size of a basketball, then Pluto (1,430 miles in diameter- roughly the size of the United States from the Canadian border to Mexico border) would be equivalent to a golf ball (1.68 inches in diameter). At that reduced scale, the basketball and the golf bar would be approximately 50 miles apart. If time is constant with the nine year journey of New Horizons between Earth and Pluto, then a microscopic space probe leaving the basketball would have to travel approximately 5/8″ per minute for nine years until it reaches the golf ball 50 miles away, assuming that there is no air resistance.